October is Literacy Month and today was the Storybook Parade. 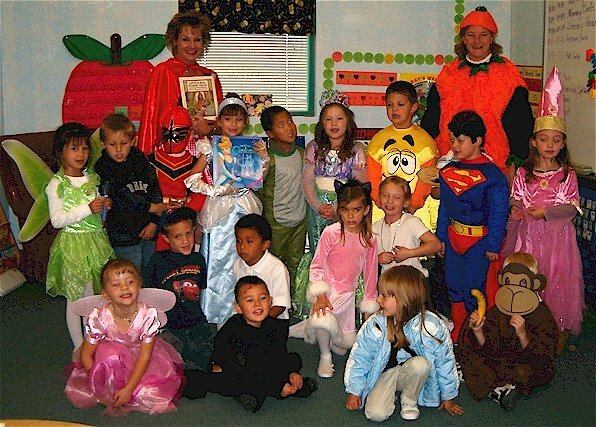 All of the student were asked to dress up as their favorite storybook characters. When I asked Sam who he wanted to dress up as, he didn't even hesitate - Curious George! I made Sam's costume out of brown felt. It has a zippered front and a tail, tethered with fishing line to the back collar to keep it up and moving with him. His mask is a foam monkey face I found at the craft store. I simply cut out the eyes and punched holes for a ribbon to tie it on. I thought the banana was the crowning touch, but Sam says the tail is the best part. Everyone loved Sam's costume. This is NOT Sam's Halloween costume. He has already chosen to be the Black Knight, but with 13 days left, that may be subject to change. It's not unusual for Sam to have a couple of costumes. That has got to be one of the best costumes I have ever seen for the Curious George character in my life! I love the mask, the tail and then how he also has the banana with him to top it all off! I can't wait to see what Sam wears for his Halloween costume. Balloon Fiesta 2006 - "Glow-deo"